Mickey Edwards is a giant 6 foot 7 inch fast-bowler hailing from the northern beaches of Sydney. 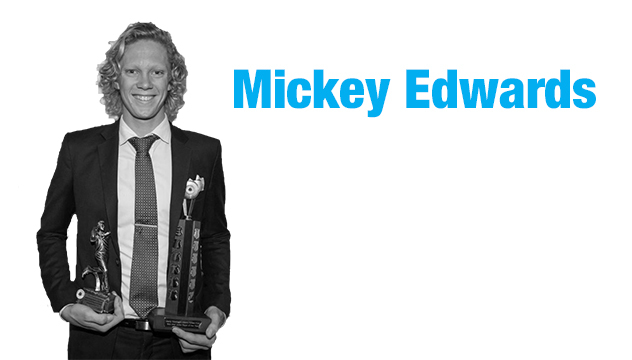 Since making his 1st Grade debut with Manly Warringah in the 2012/13 season, Mickey has won a First Grade Premiership in Sydney and represented NSW 2nd XI and Sydney Sixers in the BBL. Mickey was rewarded for his stellar season in 2014/15 and was signed with the Sydney Sixers for BBL|05 and also with NSW as one of their rookie players. His next two seasons were unfortunately been interrupted due to stress fractures, but commenced bowling again in the 2017/18 JLT Cup where he made an immediate impact with impressive figures of 4-31 in a lively spell v Tasmania at the WACA. Mickey became an instant cult hero at the Australia v Pakistan Sydney Test match in January 2017 where he came on to field as a replacement fielder for Dave Warner. Click here to watch. He made his BBL debut for the Sydney Sixers in December, 2017 then made his First Class debut for NSW in January 2018. Manly Warringah Junior Player of the year 2014/15 after taking 48 wickets at an average of 18. Awarded NSW Rookie contract for 2014/15. Awarded a full Sydney Sixers contract for 2014/15. 12 5-wicket hauls and 15 4-wicket hauls for Australia thus far. Player of the 2015 ICC Cricket World Cup. Fastest player in history to reach ODI wickets. Bowled fastest delivery in Test history (160.4 kph). Record for most wickets in an Australian ODD competition (26).